After a few minutes I am reminded as my heart aches from processing this new piece of information that this movie ironically was on the tv on another hard day in my life. That realization, the recall of that memory, and life following suddenly makes it easier to process this new added section to Kaleb’s file. That day was the day after Kaleb’s diagnosis of Down syndrome. It was also our last night in the hospital. I was going to be discharged the following day. TJ and I had come back from the NICU to our postpartum room. He was out of the room getting dinner. I had turned on the tv and found the movie Avatar. But I realized I couldn’t focus on anything on it. I remember wondering if I would always feel this way. I was hurting and aching but I was in this bubble. It was an intense feeling. I felt everything inside, and everything ached and hurt, but I couldn’t seem able to feel anything outside of my own personal bubble. I’ve spoken before about wondering about life in the future. Would I, or could I truly feel happy about this new life I was handed. I remember thinking this is not the life I was expecting. I never thought I’d be a parent of a preemie, a parent of a child with Down syndrome. I worried about our future. This was what was going through my mind as Avatar played in the background. But of course life went on. I soon realized how unfounded my fears were. Fast forward two and a half years of Kaleb living an ornery and happy life. We know his biggest struggles are his gross motor skills. I had concerns but were afraid to voice until one of his PTs brought up that she believed Kaleb was dealing with stiffness in his legs, especially his ankles. I then admitted my own feelings with it. I began to work on getting referred to a neurologist. Kaleb had two brain bleeds at birth. A grade 2 and another which was grade 2, borderline grade 3. Today we went to see the neurologist. Today we got the diagnosis of spastic diplegia Cerebral Palsy. Even though I knew that it was a pretty good probability, it was tough. Not many with Down syndrome also have a dual diagnosis of CP. Those with Down syndrome often have varying levels of low tone. While many with Cerebral Palsy, especially spastic CP, have varying levels stiffness or high tone. With Kaleb these fight and work against each other. It brought back a lot of old feelings. I remember feeling very alone that not many deal with both a micro preemie and a diagnosis of Down syndrome. 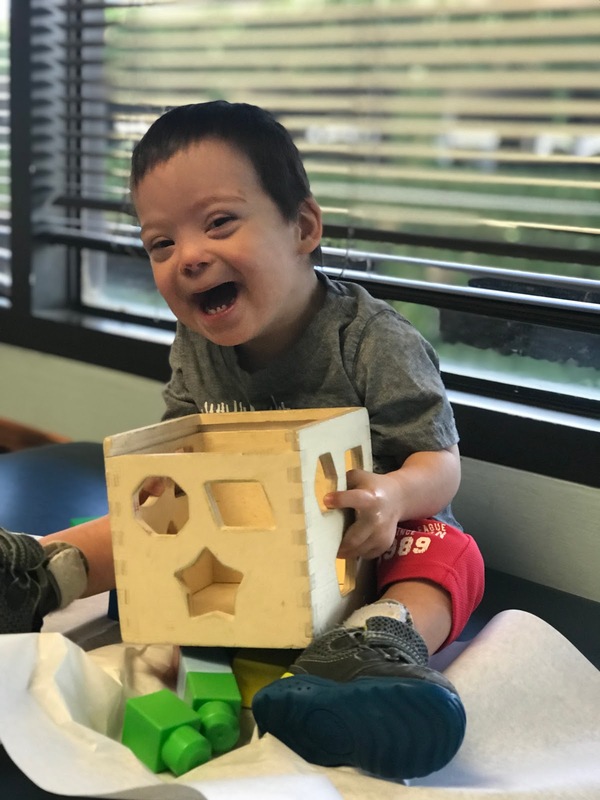 Even though I see the difference between many of the children with Down syndrome and Kaleb when it comes to crawling, standing, and walking, I didn’t feel the distinction and feelings of loneliness until the official diagnosis. Now we are again pretty unique in dealing with both CP and Down syndrome. So these were the feelings I was feeling when I realized the movie playing in the background. So while the movie Avatar might not hold that much significance for many, it does for me. Because it took me back to another tough diagnosis. 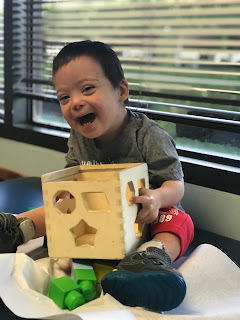 While I am not dealing with the same feelings I felt with Kaleb’s very early arrival and diagnoses, the memory reminded me not only of my initial feelings but that life does go on. Yes, this is another thing that I never dreamed I would do, be a parent of a child with CP. What can I say, Kaleb continues to take us on many adventures. While it is never fun to receive a new diagnosis, in the same breath it can be good. It can be good to get answers. 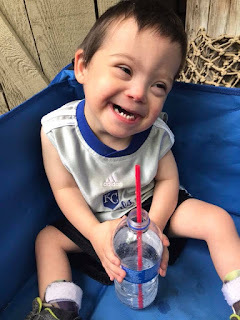 As I said, I have watched over the last year how Kaleb seems to struggle with gross motor skills more than most of his peers with Down syndrome. It helps support the reasoning for why he learns new skills in the bath and why he loves baths where he kicks up a storm. The water helps ease the issues with the stiffness and low tone and move a little easier. This information now allows us to work with Kaleb on skills while better understanding all of the issues and obstacles he’s facing. It allows us to better help him and help him reach his potential. I’m not saying that I am fully at peace with it. Ask any parent of a child with special needs and they will tell you it comes in waves or cycles. This new diagnosis is no different. So just like Jake Sully in the movie Avatar, who learns to adapt to his avatar and then grows to love the planet of Pandora, I know that our family will adapt as we travel down these many adventures. God picked the perfect mom for Laleb, you've got this!